I wanted to feature this awesome artwork of the Resurrection because it has so much packed into this simple picture! Plus, it kind of outlines some of the pivotal moments of the Easter season. Resurrection of Christ, by Master of the Amsterdam Death of the Virgin, c. 1485-1500. Rijksmuseum, Amsterdam, Netherlands. In the front, Jesus stands, triumphantly climbing out of His tomb holding a triumphal cross while the guards either shrink back in terror or faint at the sight of Jesus. Which is completely understandable… if I saw Jesus in all His glory when I was responsible for executing Him, I would be terrified too! An angel also shares the scene, moving the heavy lid of the tomb out out of the way so Jesus can come out. 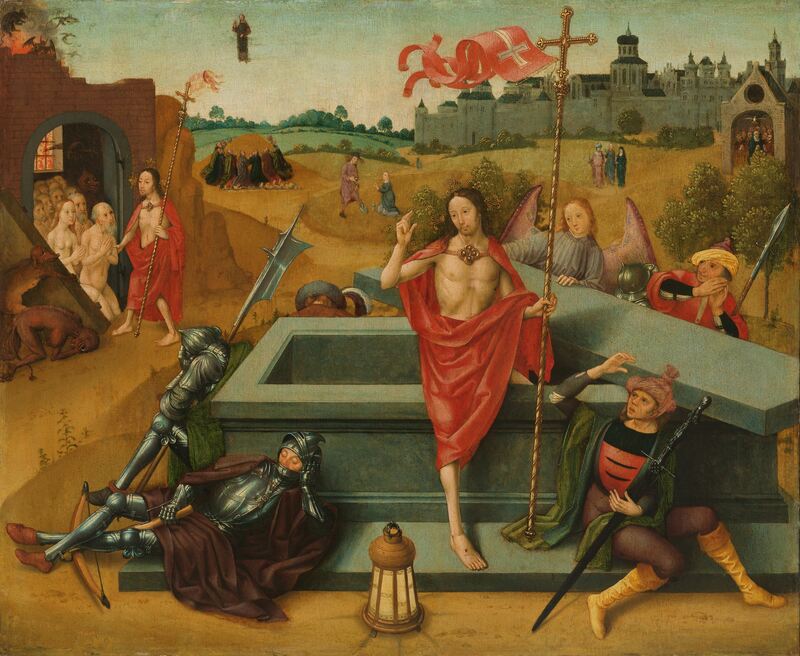 In short: this is your typical Resurrection scene as displayed in Western European art! But there are also other scenes in the background as well! To the left, the Harrowing of Hell can be seen, in which Jesus rescues the just souls from Limbo so that they might partake in the joy of Christ’s resurrection. In this case, Adam and Eve kneel down to Jesus while Jesus, the new Adam, takes Adam by the hand. While this technically took part on Holy Saturday, this triumph of Jesus defeating death and Satan is often celebrated simultaneously with the Resurrection… indeed, in the older Orthodox tradition, icons of the Resurrection are not of the actual moment where Jesus bursts out of the tomb, but of the Harrowing of Hell! To the immediate right of the triumphal cross that Jesus holds, you can see three figures — these are the figures of the women who are coming to the tomb to finish the hasty burial job that they started. They each hold a container of oil! Then, to the left of the triumphal cross that Jesus holds, you’ll see Mary Magdalene kneeling down to Jesus… except Jesus is dressed in very funny clothes, including an awesome hat, and holding a shovel. Why? Because in the gospel, Mary Magdalene confuses him as a gardener! So, Jesus looks like a medieval peasant, since they would be the ones who did gardening back in this time! There’s also an image of the Ascension! To the direct right of the Harrowing of Hell image, Jesus ascends to heaven while the eleven disciples (yes, I counted!) kneel down, praying, and watch Him leave. Finally, there is an image of the Pentecost — which is the official end of the Easter season! If you look at the very right of the picture, you’ll see into a building. Inside the building are Mother Mary and the eleven disciples (again, I counted!) gathered together, with a dove descending on them and tongues of flame over their heads. So why are these images all packed together? At this time, many religious artworks had lots of scenes crammed together in one artwork to give viewers a kind of epic, grand-scale look at the entire season so that they could more easily picture it in their heads. After all, there were no movies at the time! Instead, artwork, combined with the stories from the gospel, gave the people a sense of the enormity of the gospel, and the various little scenes gave viewers a sense of movement to the season. So basically? Consider this a visual road map to the Easter season!